Anyone who has traveled to the exquisite natural wonderland of Carlsbad Caverns has likely visited the nearby city of Carlsbad, New Mexico. 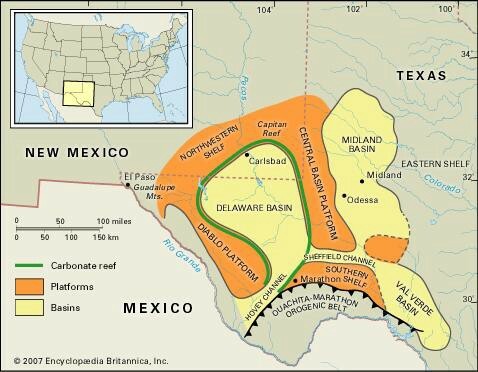 Just 20 miles to the northeast from the national park, Carlsbad lies in the northwest region of the Permian Basin, which was formed by an ancient seaway hundreds of millions of years ago. 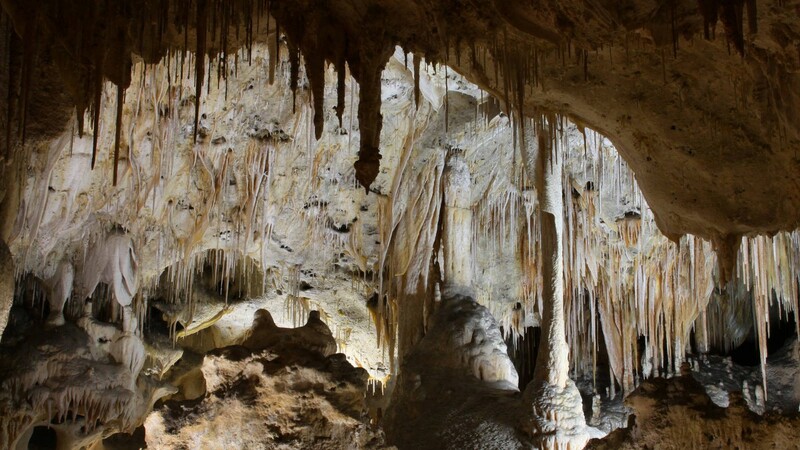 The surrounding limestone caves, which include the famous park’s caverns, are remnants of fossil reefs that were built by the action of sponges and algae long ago. The sedimentation of this prehistoric seabed has proved rich in oil and natural gas reserves, and is now fueling a fracking bonanza that is generating much needed revenue and jobs to an otherwise depressed economy. However, environmental and safety concerns grow over the dangers fracking poses to the local water supply, and the potential of triggering a collapse of a massive sinkhole that lies under the city. 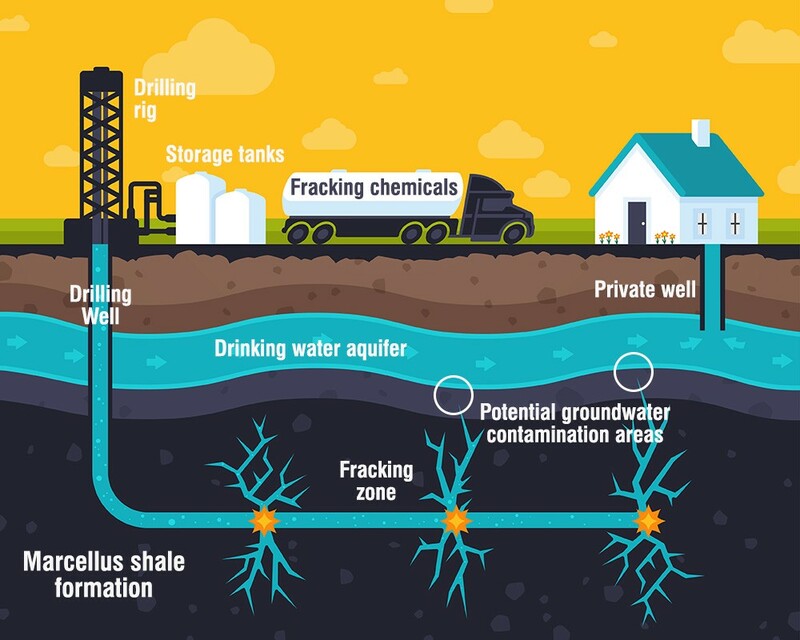 Fracking, also known as hydraulic fracturing, is a process by which pressurized liquid is forced into underground, manmade shafts to create cracks in deep-rock formations to release natural gas and oil. The shafts can be vertical, horizontal, or diagonal. The pressurized liquid, also known as ‘fracking fluid,’ is made up of water, sand, and a variety of chemicals, including highly toxic ones like benzene, toluene, and formaldehyde. There is evidence that fracking fluid can seep into an area’s groundwater supply. After nearly a decade of complaints by local residents and activists, the Environmental Protection Agency found that fracking contaminated the drinking water of Pavillion, Wyoming. 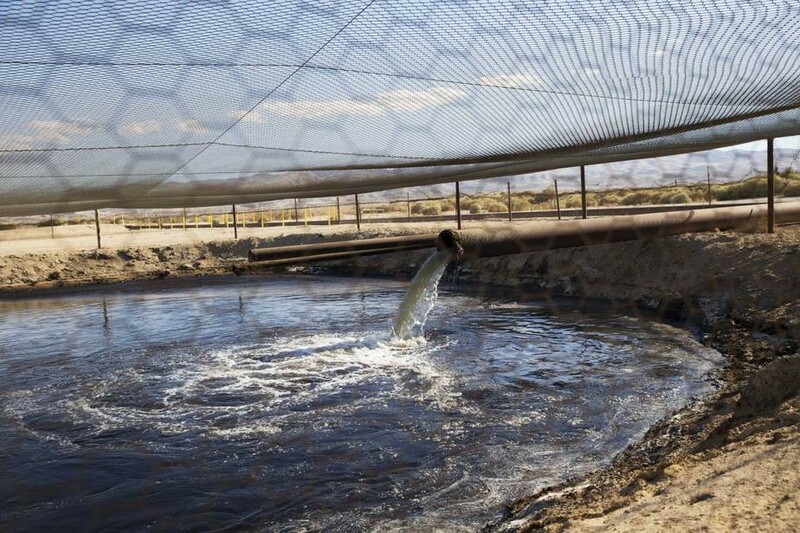 Once the petroleum products are extracted from the fracking fluid, the fracking waste is often disposed of in nearby shallow pits, some of which are unlined. In addition to the chemicals added to fracking fluid, fracking waste can contain heavy metals and radioactive materials dislodged during the fracking process. Pit where fracking waste is dumped. Each frack uses approximately 5.1 million gallons of locally-sourced water and anywhere from 80–300 tons of chemicals. Meeting the water demands for fracking are unsustainable, especially for drought-prone states like New Mexico. In many states, frackers are not required to disclose which chemicals they use in their fracking fluid, citing ‘trade secrets.’ Moreover, due to loopholes in the laws of many states, frackers are exempt from having to monitor or disclose the potential toxins in their fracking waste. Beyond the concerns over excessive water use and threat of ground water contamination, there is serious anxiety over another pending fracking-related disaster for the city of Carlsbad. As part of the area’s cavern formations, there exists a massive sinkhole at the southern border of the city. New cracks and holes have been developing around the sinkhole in recent years. 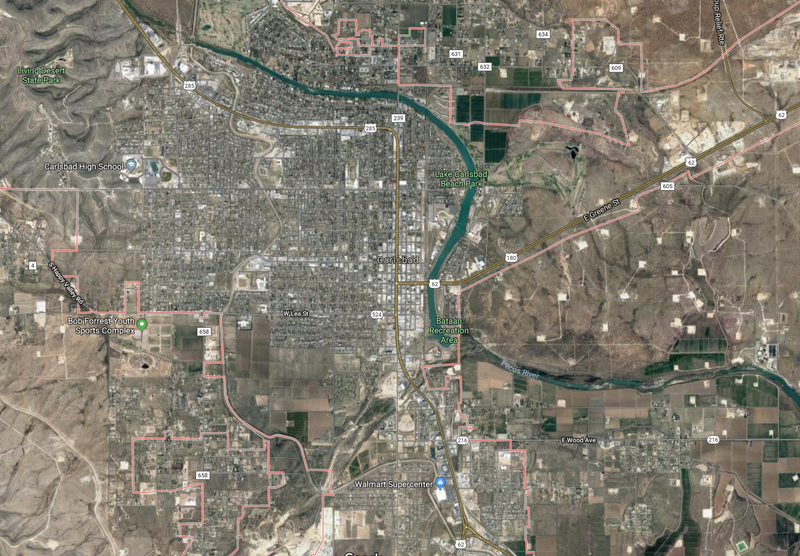 No one is willing to say if these are the result of increased seismic activity related to fracking, but the location of the new cracks and holes are where a now-defunct company obtained water for fracking operations. Carlsbad’s population exceeds 26,000. If the sinkhole should collapse, the toll would surely be deadly and costly, with estimates of more than $1 billion in economic loss, and over $100 million for clean-up. Although the oil and gas industries have enjoyed record profits from fracking operations in New Mexico, lawmakers are seeking an initial $40 million in state funding to deal with the problem. At this point, it’s not a matter of if the fracking-related sinkhole in Carlsbad is going to collapse, it’s a matter of when. And when the sinkhole does collapse, questions of, “How could this have happened?” will be met with shrugged shoulders from the oil and natural gas companies, and blank stares from lawmakers. With little local or federal oversight of the fracking industry, and no incentives to change that, fracking will continue to be a threat to the environment and people. 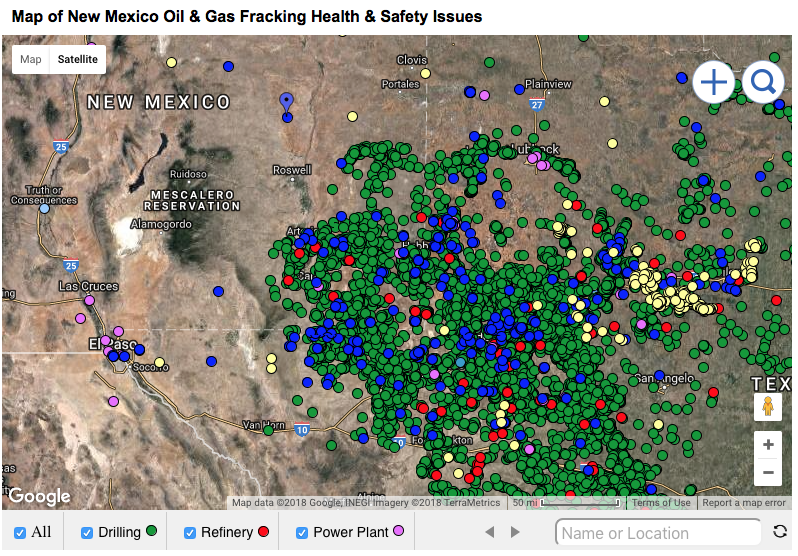 Ultimately, Carlsbad is just one of many fracking disasters waiting to happen.